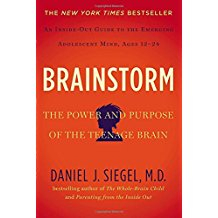 Just finished this book on that intriguing creature that is the adolescent brain. I read it and listened to it both. A little slow in the middle, but definitely worth the time to better understand the adolescent mind and normal (but seemingly abnormal) adolescent behavior! “ES: An Emotional Spark is revealed in the enhanced way emotion generated from sub-cortical areas washes over the cortical circuits of reasoning. The downsides are emotional storms and moodiness; the upside is a powerful passion to live life fully, to capture life being on fire. SE: Social Engagement emerges as teens turn more toward peers than parents, the downside being falling prey to peer pressure simply to gain membership in a group, the upside being the central importance of supportive relationships in our lives. Relationships are the key factor associated with medical and mental health, longevity, and even happiness. N: Novelty-seeking emerges from shifts in the brain’s dopamine system with the downside of risk-taking behavior and injury, and the upside of having the courage to leave the familiar, certain, and safe home nest for the unfamiliar, uncertain, potentially unsafe world beyond.